Home BOX OFFICE KIM CHIU MOVIES THE GHOST BRIDE BOX OFFICE 'The Ghost Bride' Box Office: Kim Chiu's 1st solo movie is a certified hit! 'The Ghost Bride' Box Office: Kim Chiu's 1st solo movie is a certified hit! 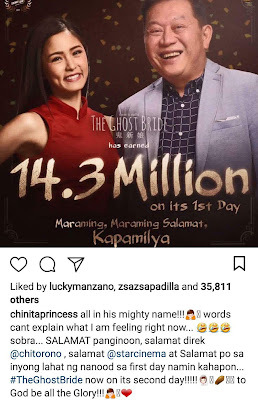 Kim Chiu has just claimed her crown as the newest Horror Box-Office Queen, when her movie 'The Ghost Bride' earned an impressive P14.8-million opening day gross at the Philippine box-office. Despite opening on November 1, when most Filipinos were busy at the cemetery remembering their departed loved ones, 'The Ghost Bride' managed to attract thrill-loving moviegoers and earn that high. It's also noteworthy to think that it opened against 2 other new horror releases ('Spirits of the Glass 2' and 'Jigsaw') and faced competition versus a major Hollywood blockbuster on it's 2nd week ('Thor: Ragnarok'). Kim Chiu herself broke the good news via Instagram, and shared how happy and thankful she is for the box-office success. Then within 5 days, 'The Ghost Bride' already has P51.5-million box-office collection. With that gross results, the Chito Rono-directed film under Star Cinema is now guaranteed to be the next P100M-earning movie after last month's 'Seven Sundays', which debuted with P10M and grossed over P100M within its 1st week. 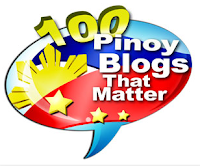 'The Ghost Bride', which was Graded A by the Cinema Evaluation Board, will surely pick up more millions this weekend, backed by great reviews by those who have already watched it on opening day, including this blogger. I already said via Twitter and Instagram how I loved this wonderful horror film and how Kim Chiu impressed me by her superb lead performance as Mayen Lim. Watched The Ghost Bride on first day & I loved it! It's Kim's first ever solo film, not capitalizing on a loveteam, and it has been made official: she succeeded!